Frank Bowling (b.1936) has since the Sixties been living and working in both London and New York, more or less dividing his time between these two great cities, developing a twin-track career. His exhibitions, accomplishments and friendships with other artists and critics on both sides of “the pond” are by turns numerous, impressive, and generous. Nevertheless, it is his large-scale and ambitious achievements on the canvas that make us particularly pleased to show Frank’s work in the forum of Poussin Gallery. His quest for a new and total “all over” form - by means of a simultaneously primitive and sophisticated endeavour – seems always to produce original results. There is no other painter who has covered so much ground in the field of the beautiful and controlled dispersal of paint across a surface. Then, too, there exists a formalising proclivity sometimes in Frank’s working processes, where swathes of mixed colour so intuitively arrived at are physically cut up or cut through and re-ordered within the pictorial rectangle, with a somewhat more detached (and perhaps mischievous?) judgement. All fascinating stuff, and part and parcel of Frank Bowling’s natural talent for painting, as demonstrated in these big and radiant new works. In October 1821, John Constable got a letter from his friend Archdeacon Fisher which touched on an angling expedition. Fisher had taken his rod and line to the New Forest where he had found a “fine, deep, broad river with mills roaring backwaters, withy beds, &c”. This reminded him of his painter friend, who in reply produced one of the most famous effusions in art history, about “the sound of water escaping from old mill dams.. willows, old rotten banks, slimy posts and brickwork, I love such things”. His “careless boyhood” on the banks of the Stour had made him a painter. Constable might have appreciated the piece of wood floating – as it’s hard to resist putting it - in the centre of this picture. It’s not a ‘slimy post’ but a bit of a buddleia bush from Peacock Yard, the slightly Dickensian corner of South London where Bowling has his studio. The painting was titled after a news item in the Daily Telegraph, where it was reported that some indigenous people up country – an area, by the way, that inspired Conan Doyle’s “Lost World” – had lost their much loved piano, which was devoured by termites. A philanthropist bought them a replacement, but the only way to get it into the interior was by raft, along surging torrents. Bowling’s painting evokes all the thoughts this ‘mad idea’ gave him: the flora flowering by the banks, some of which the locals call bush nuts and use for food, the turbid stream. But – and this is crucial – he wanted to do so without making “an illustration of the notion”. Not only are Bowlings pictures abstract in appearance, they are abstract in origin. His usual way of beginning is by pouring and dripping paint in a Jackson Pollock-like manner. After a while, from these marks, certain forms, memories or associations emerge. The picture hints to the painter that it wants to go in a certain direction, and so he carries on. It’s a process of quest, sometimes almost akin to the free-association of psychology. A blob that appeared in “Shrill” struck the painter as a roughly-sketched head of his mother. The title of “Pondlife (after Millais)” was suggested by a fellow occupant of a studio in Peacock Yard – and it does indeed have the feeling of a shady and weed-covered Pre-Raphaelite pool. There is a profound point there. De Kooning famously observed that ‘flesh is the reason oil paint was invented”. But water comes close, and not only in the case of oil pigment. There is also Chinese ink, Turner’s water colour and Bowling’s acrylic to be taken into account. Water is one of the perpetual subjects of painting – in the Far East, in Vermeer and Ruysdael’s Holland, in the Italy of Claude. As Frank Bowling’s old mentor Clement Greenberg argued, landscape painting seems to morph into abstract expressionism in Monet’s epic series of paintings of his pond. Those are of course simultaneously depictions of a garden feature at Giverny and images of everything – the microcosm, the macrocosm. There is, as Bowling suggests, some affinity between water and the fluid medium of paint. There is also a deep connection between the thick media – oil and acrylic – and the environs of water: the ooze, mud, silt and flotsam of the river bed. In Bowling’s painting, you are apt to see not only aqueous flow but also chunks of this and that. He likes to add objets trouvées to the mix, such as that buddleia stem, or an empty pill container. These function in his paintings as gravel or drift wood in water courses; sometimes they become so immersed in painterly goo and glup that it is hard to guess their identity. These elements of collage give the pictures an earthy toughness. That brings us back to Constable and his beloved “rotten banks, slimy posts and brickwork”. It wasn’t just the waterways of Western Suffolk that made him a painter – it was the ambiguous zone in which solid matter meets fluid, and both suggest a deep analogy with paint. 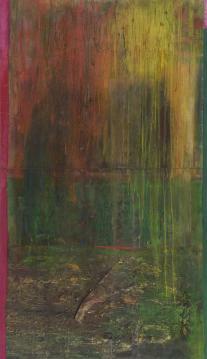 The same could be said of Frank Bowling.